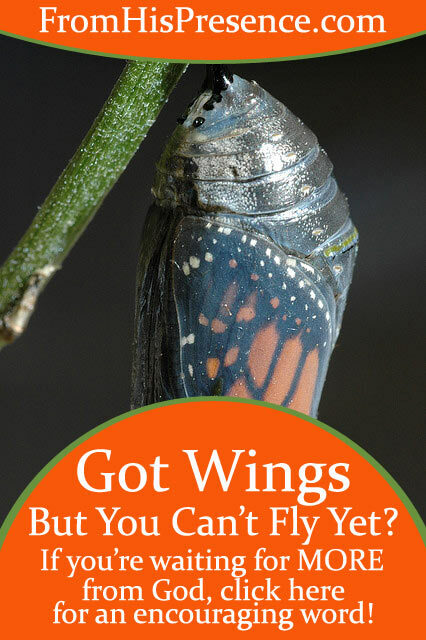 Got Wings But You Can't Fly Yet? Got Wings But You Can’t Fly Yet? Today’s post is for those of us (myself included) who are waiting for MORE from God. Do you ever feel like you have wings, but haven’t had the chance to fly yet? I do. My heart longs to fly; to experience all that God has promised me. If God has ever promised you anything that you haven’t received yet, you probably feel much the same way. Days like that can be hard to handle in a godly manner. I was having one of those hard-to-handle-in-a-godly-manner days yesterday. Then I came home, turned in early, and spent some time reading the words of Jesus in the book of John, plus the Psalms, before I went to sleep. It helped. But it didn’t fix everything. Because you know what I really needed on a day like that? I needed reassurance from the Lord. I needed a right-now word of encouragement directly from Him. I needed Him to tell me, personally, that He hadn’t forgotten me and it was going to be ok. So I went to Him again this morning… and He was so gracious. As soon as I prayed that, I saw a picture in my mind’s eye of Jesus standing right in front of me. He was so clear and beautiful that His bigness, and the peace that emanated from His very presence, eclipsed all my pain and worry and burdens. When I looked at Him, I felt the burdens fall away, and I had rest. It was so beautiful. I needed rest, desperately. Then I began reading Isaiah 55 and 56, and you know what? Papa spoke to me. I desperately needed to hear from Him, and He did not let me down. It’s one thing to know it, but it’s another thing to hear Him say it. I needed to hear Him say it–again–desperately. Do you have a promise from God that you’re waiting to see fulfilled? Are you longing to see your destiny actually happen? He has not forgotten you either. He’s ready to give you rest right now, and He’s bringing you into your destiny… even when it doesn’t feel like it today. So keep justice! Do righteousness! His salvation is coming! He will not let you down! Do what it takes to stay focused on Jesus and rest in Him. Get alone with God. Get a right-now word from Him out of His Word; His words spoken into your spirit will carry you through. If you feel like you have lungs but you can’t breathe yet–wings but you can’t fly yet–you’re not alone. But God is faithful. The same God who has always been faithful to you will continue to be faithful to you. Are you waiting for God to do something specific in your life? I’d love to hear your thoughts on this subject. How would you encourage others who are also waiting? Leave a comment below! But Don’t You Have To Work For Your Destiny? Nope! Image courtesy of JohnMccombs on Flickr. So much of life involves waiting, but when we trust God, we have to trust His timing. It isn’t easy, but we know what He has promised, He will deliver. Ahhh yes, timing. Perhaps one of the hardest, most mysterious things! But you are right. His ways are always perfect! He will perfect that which concerns us!